Do not confuse Bertold Hummel with any Hummel that appears in Grove. This music is exactly as the title explains. It is simple music, all of which can be played in first position, apart from die occasional E in die cello part. There are five movements, offering varied challenges to the performers. There is an Elegie in 6/8 time with some syncopation, followed by a Tango, always with 2 parts doubling the rhythm. The Sarabande has plenty of accidentals to keep the players concentrating, and give them practice in 'high' and 'low` finger patterns. There are some good 2nd violin leads in die finale. 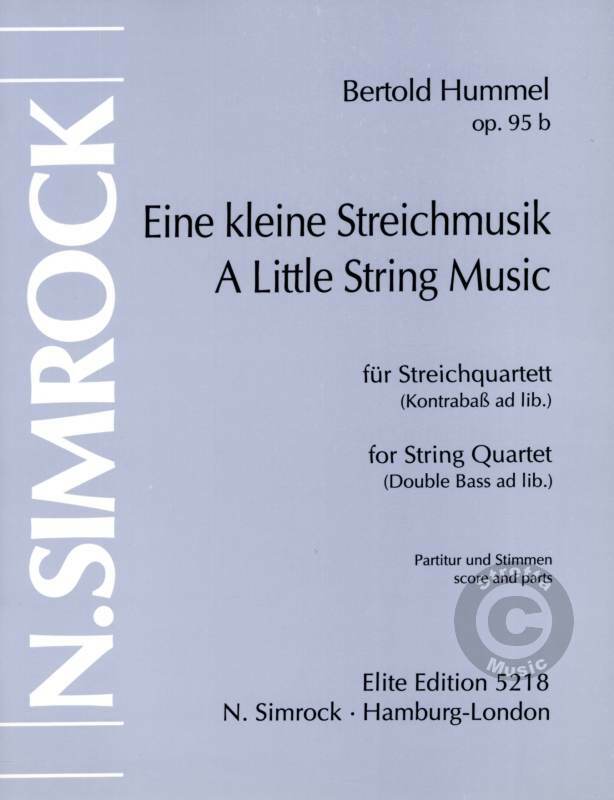 The music can be played either as a string quartet or by a string orchestra, in which case extra parts are available. Rather surprisingly there is a printed double bass part (ad lib.) which is identical to the cello part (as far as I can tell). The viola part is written as such, and therefore uses die C string. The quality of printing is poor, with jagged crescendo marks and slightly uneven note formation, but is nevertheless still clear to read. The bars are numbered, and the music folded to avoid page turns. I look forward to using the music.